If you’d never met the guy, you’d still get a pretty good sense of who he was by reading the bumper stickers on his ancient Volvo. The left side advertises City Lights Bookstore in San Francisco. The center simply states “READ.” And on the right, that iconic statement by Allen Ginsberg, “HOWL.” That old Volvo sits driverless and rusting in a ramshackle small garage tucked in the woods behind Bill Edison’s lovely Menemsha cottage that he shared with his beloved Lydia for more than 65 years. 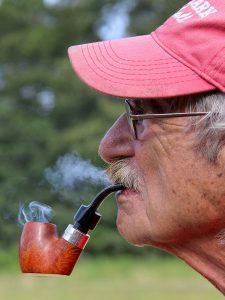 Most of the guys on the softball team, the Sunday morning game he and Billy Meegan resurrected back in ’02, knew him as that likable old guy, former teacher and Chilmark Community Center counselor, and pipe-smoking aficionado of all things softball. A bit of research and a few interviews offer a pretty fascinating life, far more interesting and complex than originally imagined. So Vineyard, really. William Morton Edison died on Oct. 11, 2017, at his winter home in Elk, Calif. A neighbor discovered him sitting in his favorite armchair, a pipe by his side and a recently written article for the local paper on his lap. He seems to have passed quietly in the night. His wife of 67 years, Lydia Tyler Edison, had died a year earlier on June 10, 2016. It was clear to those who knew him well that he was ready to move on. Lydia’s death left him heartbroken and lonely. He could not get over it, yet he lived with it — finding comfort and solace attending the Sunday morning softball games as well as visits from his many friends. Ed Sussman and Dana Nunes were loyal and steadfast; they visited almost daily to make sure he was OK. Caleb Caldwell and his wife Mary likewise would pay visits, cook meals, and share good wine with him, as did Bill Meegan and others who would gather to recite poetry and drink Bill’s favorite bourbon with him. It was comforting for Bill to have his village look after him, to embrace and take care of him during that lonely time of grieving Lydia. Bill Edison was born in the winter of 1928. His paternal grandfather, Abraham Edison, was a perpetually struggling Jewish peddler and leather merchant from Latvia. He had five sons, including Bill’s father, Simon, who opened their first shoe store in Atlanta, Ga., in 1922. That store became the beginning of a financial enterprise that would extend to more than 1,200 stores selling low-end to high-end fashion shoes and men’s and ladies’ apparel. Although he lived a comfortable life, Bill related that his parents were liberal progressives and great admirers of President Roosevelt. In fact, Edison Shoes was one of the first retailers to offer a pension plan, a health plan, and even stock options to store employees. Since St. Louis was a shoemaking and leather center, the Edison brothers moved their headquarters there, and thus Bill spent his early years growing up in St. Louis. Bill’s love of nature and appreciation of sports developed during his early adolescent years at Camp Androscoggin. This all-boys summer camp in upper Maine was notable for the many prominent Jewish New York families who sent their sons there. Among the boys whom Bill got to know at this camp were Tom Lehrer, the noted singer, songwriter, and political satirist, as well as Alan Jay Lerner, William Zuckendorf, and Sidney Newhouse, among others. 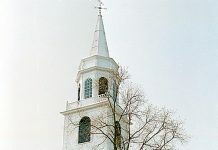 Tom Lehrer remained a lifelong friend, and Bill made it a point to visit him in Cambridge annually when he left the Vineyard for his home in California. The bumper stickers suggest Bill’s affinity for the Beat era. Conversations with Bill’s daughter, Miranda, elaborate in more detail Bill’s longstanding friendship with Lawrence Ferlinghetti and his affinity for the San Francisco era of the ’50s and ’60s Beat generation. Bill served as a part-time bartender at El Matador, San Francisco’s infamous bar frequented by all the great writers and jazz artists of that time. He got to know Kerouac and Saroyan as well as Ginsburg, who read his poem “Howl” there one night. It is quite apparent that Bill’s offbeat and playful personality preceded those times, but certainly allowed him a place and a time to be who he was. Bill actually met Lydia on a blind date — the penultimate blind date, in that Bill purposefully did not wear his glasses so he’d appear more attractive. He related that he could not read the menu or even see where he was actually going, confessing that he was literally blind without the glasses. He stated at the time that he wasn’t really able to make out what she looked like. Yet Lydia slipped him her phone number, and the rest is history. One can’t tell the story about Bill without talking about Lydia. From that first date they were inseparable throughout the rest of their lives together. Lydia was born in New York City in 1928. Her father, Hugh Tyler, was a WPA artist — noted for his murals as well as still life paintings. Her mother was an accomplished pianist who played in Broadway musical orchestras. Lydia grew up on Macdougal Street in Greenwich Village. Lydia, a beautiful, ethereal writer of poetry and short stories, attended Smith College — “tolerated it,” as she put it. They married shortly after they both graduated from college. As a wedding present, Lydia’s father gave them the lovely piece of land on the bluff of the Menemsha north shore where Bill eventually built the cottage that stands today. The war had ended, and after the wedding Bill and Lydia wound up in Paris, ostensibly for their honeymoon, although they fell in love with Paris, where Bill eventually got an administrative job with the Marshall Plan. According to Miranda, Bill was not particularly effective as an administrator. He was reported to have inadvertently disposed of some critical secret documents by accidentally dropping a burning cigarette into a file cabinet. But they loved their time in Paris — the postwar energy, the jazz, and the flourishing Bohemian scene of writers and artists. They eventually returned to Bill’s home city of St. Louis, where they found themselves bored and unstimulated. They wound up in San Francisco, where Bill got a job as a teacher at the Francis Scott Key School. They were the quintessential intellectual, semi-Bohemian and progressive-thinking young folks of that era. They were part of the Beat generation, and older siblings to the hippie generation that emerged later in the ’60s and ’70s. From that era they were both staunch advocates of civil rights and social justice. As an educator, Bill’s teaching methods mirrored his progressive thinking. He incorporated a love of nature and sports, most likely evolved from his camp days, into a Walden-type model of education. He designed an educational program called “Wheels the Bus School” that took inner-city kids on weekend and summertime camping trips. In his low-key way, he spent a lifelong career providing learning opportunities for countless numbers of kids using nature, sports, and the golden rule as the prevailing model for success. Bill spent those early summers as a counselor-teacher at the Chilmark Community Center. He coached and taught all sports, including softball, basketball, and tennis. He also participated in what was already an established Vineyard tradition, the Sunday morning softball game in Chilmark. Peter Simon reflects on those years: “I first got to know Bill during my early years at the Chilmark Community Center. He was the informal softball coach for us upstarts, and he taught me the nuances of the sport. He noticed that I had good eye-hand coordination and foot speed, but clearly was not a power hitter. He told me to observe athletes like Pee Wee Reese and Pepper Martin to get my mojo. He had total faith in me, and encouraged me every step of the way. I learned how to ‘hit them where they ain’t’ and had a 40-year career of up-Island softball competition. “As Bill aged, his softball preoccupation didn’t. I’ll always be grateful to him for taking me seriously and showing me how not to let the bullying bother me.” Peter added that as a coach, Bill not only taught the game, he empowered the players to play to their strengths — again, using sports as a life lesson, and getting kids to believe in themselves. Went to Nicaragua as part of a Baseball for Peace mission. One gets the sense that he was the original Merry Prankster before Ken Kesey coined the phrase. Bill is survived by his three children, Katie, John, and Miranda, as well as his cat Zorro (who continues to live in Elk and is well taken care of). Bill Edison is survived by a countless number of folks whose lives he touched and made a bit brighter. There will be a brief memorial ceremony before the opening of the Chilmark Sunday morning softball season off of Pasture Road/Tabor House Road on Sunday, July 1, at 9 am. All are welcome.